Today, greeted with a fantastic sky FULL of stars, soon to be replaced with the sun trying to push its way through the thick mist; my dream was going to become reality. I kept saying to myself this is what Dian Fossey would have experienced every morning. At 8am we arrived at the briefing hut to meet Stephen (our head ranger) who would eventually be leading us to the Bitukura gorilla group. 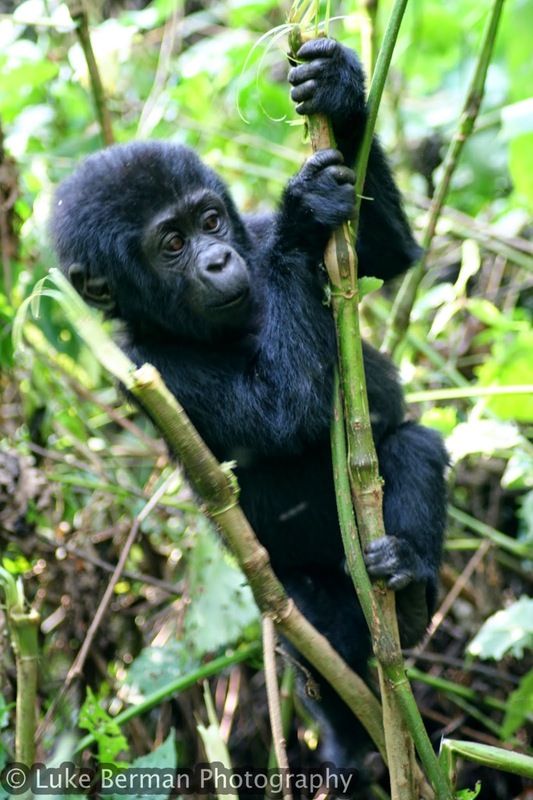 This group is made up of 13 individuals including four silverbacks, adult females, juveniles and a 13 month old baby. 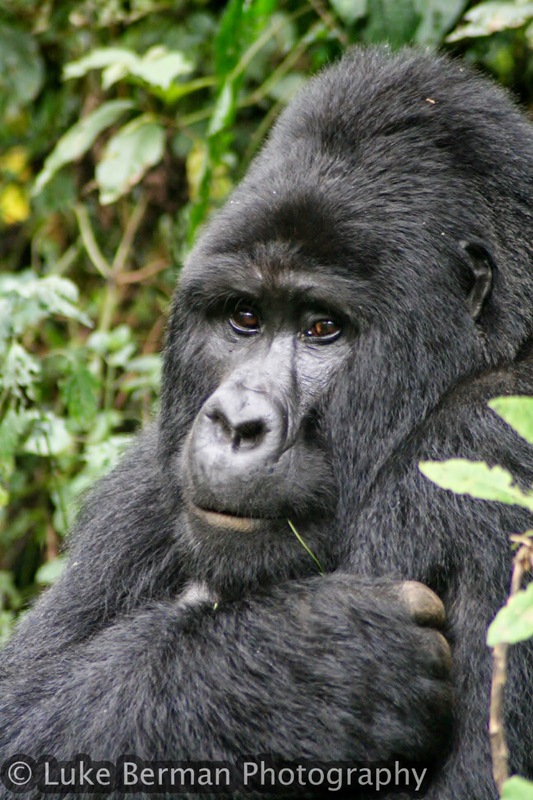 Did you know that when a male reaches 14 years old he will start to develop a silverback, it is not just the dominant male that has it. We were then told the rules such as no eating/drinking/smoking within 200m of the gorillas, the young get curious and may come close but don’t try to touch them, the silverback is always watching, to make sure we stay 7 metres away and my personal favourite was if we are charged to stay still and crouch down (better said then done I think). After the briefing we had a few moments to read more about where we were and the gorillas in general. It was fantastic to see they had scratched over the original total number of 700 and replaced it with 880. 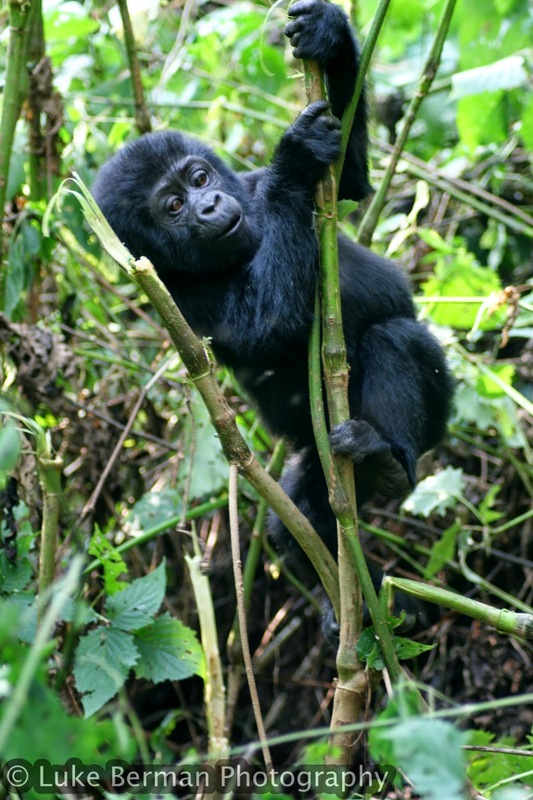 The mountain gorillas are the only species of great ape that are increasing in number; Chimpanzees, Bonobos, Orangutans and the other species of Gorilla are all declining. 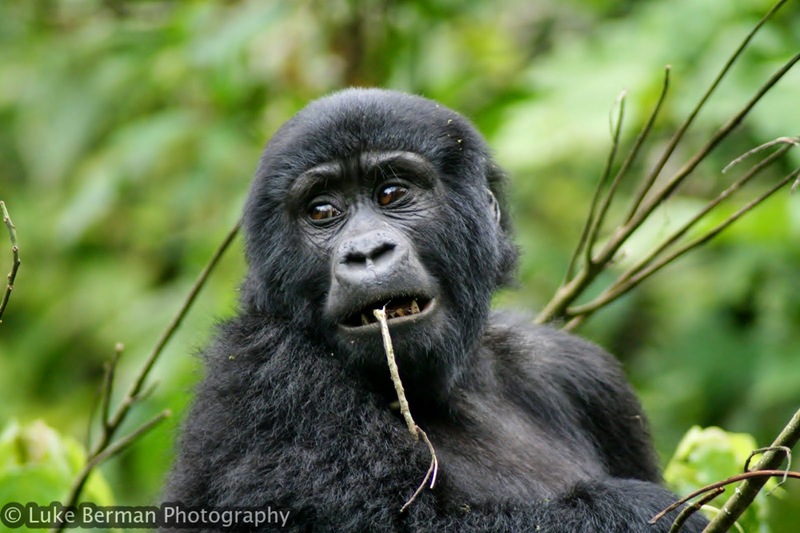 Then Stephen uttered the words I had been waiting 20 years for someone to say, “Let’s go and see the gorillas”. After a quick drive we arrived at the path into the forest, but we had to wait, Stephen was in radio contact with the rangers who would tell us when to leave so the gorillas would be in a good position and we were not walking for hours. The call came in and we were off! We started going downhill and very soon there were tall, thick ferns around us, visions of seeing Dian Fossey, Ian Redmond and David Attenborough in such a surrounding suddenly popped into my mind and I was overcome with excitement. Except for the odd bird call and the rangers using their radios it was eerily quiet as we walked. After about 10 minutes the thick ferns had turned into tall trees and we were going down a steeper hill. They had used the forest elephant’s paths to construct the ways through; I can see why it is called the Impenetrable Forest. Every now and again one of the rangers would make a whooping call and wait to hear a response to know which direction to travel in. 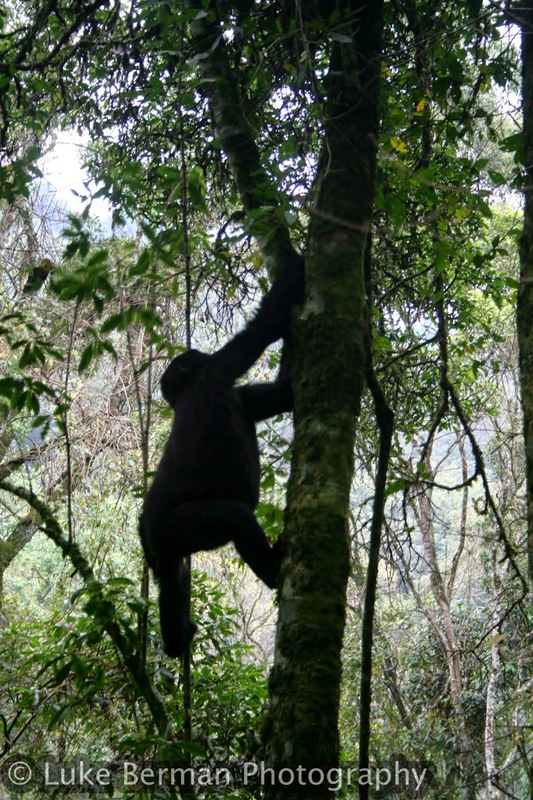 After walking for 1 hour and navigating a very steep hill we come across two new rangers, and then I realised that we must be nearby the gorillas. All of a sudden I hear some branches break and leaves rustle and a baby gorilla climbs up a small tree almost like saying “Hi there”. At first I could not quite believe I was actually starring at a baby gorilla, it was so cute and fluffy and didn't seem to have a care in the world. I grabbed my camera, dropped my bag and started snapping. As we got closer the rangers cut away the foliage nearby so we could have a clearer view in; there was the mother. If you thought gorillas were big it is nothing like when you are here standing next to them. As we got closer to the mother she welcomed us with a very loud fart that didn't seem to bother her; all that lovely plant fiber she is eating. 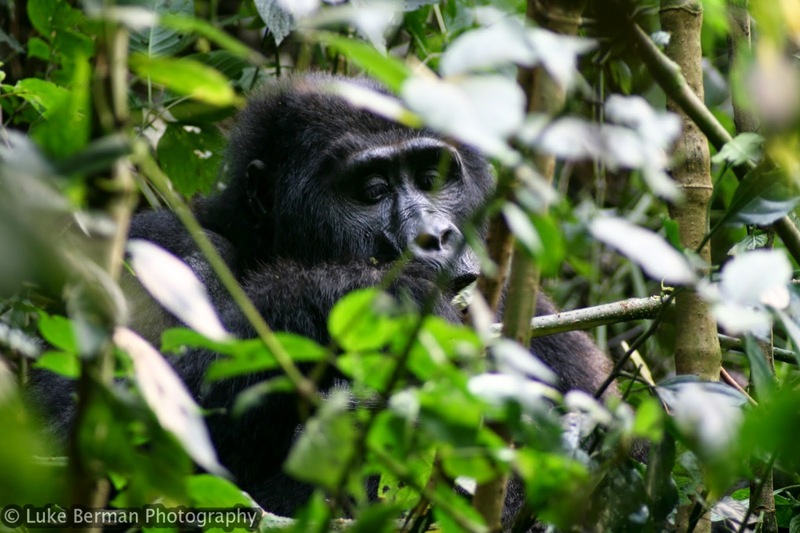 I then heard a rustle and crack to my immediate left….. GRUNT…… it was an adult male silverback and he was massive. I was currently standing 2 metres away from this guy, his head was 4 times bigger than mine and his fingers were so thick and big. I felt so vulnerable and helpless if he decided to charge; luckily I had been told to stay still and crouch if that did happen. 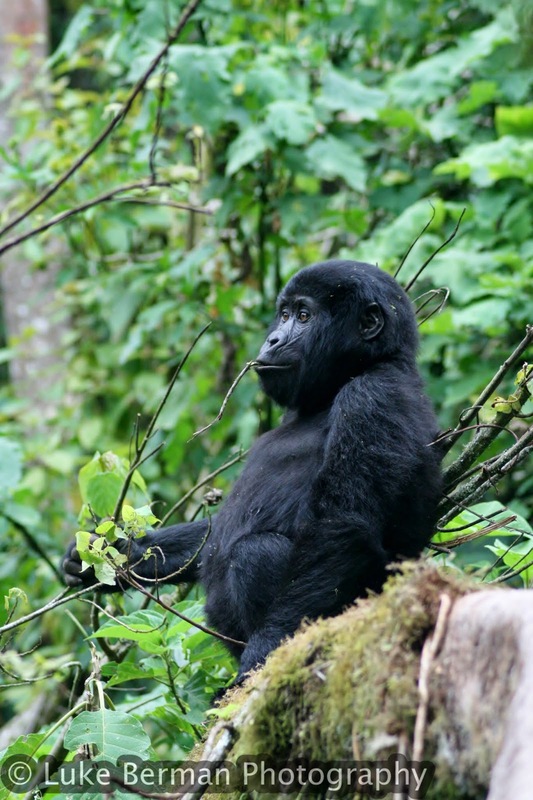 We followed their movements through the forest for the next 15 minutes, and then we saw some juveniles climbing bigger trees and another silverback. I had gorillas all around me and it just felt surreal; I would love to do this full time. I was getting worried that I wouldn't get any good pictures and then (as if they heard me) we suddenly found ourselves out of the dark, dense forest and in a small clearing. There in front of me was a youngster playing on a fallen tree, to the side the silverback was sitting and a female foraging and eating; it was perfect. Watching them go about their daily business was so interesting and there was something so familiar with the way they used their hands and facial expressions. The frequent grunts from the silverback kept reminding me not only that he was he there, but how insignificant I was in size and power. 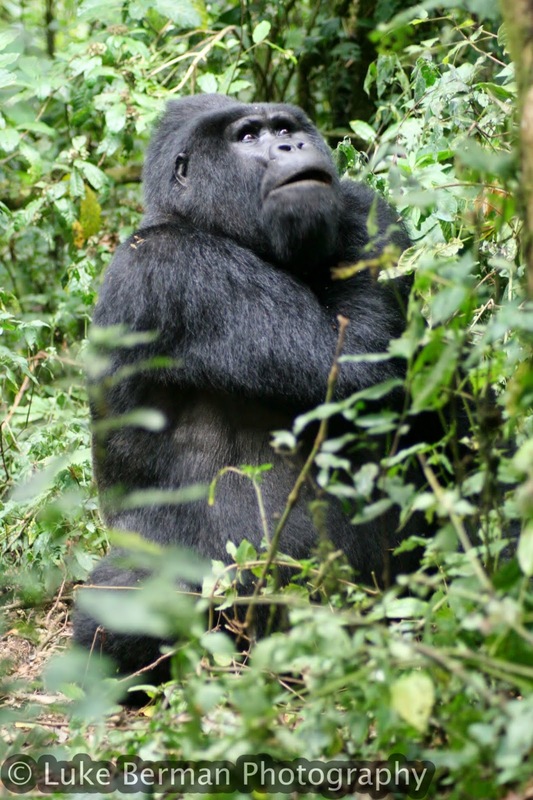 The rangers would often do grunts of their own, mimicking the gorillas sound to reassure them where we were. Also, these grunts are done from the beginning of the habituation process and act as a signal for saying it is me and you like me; we come in peace. Before I knew it I heard the words I was dreading “time is up guys”, that was the fastest hour of my life. 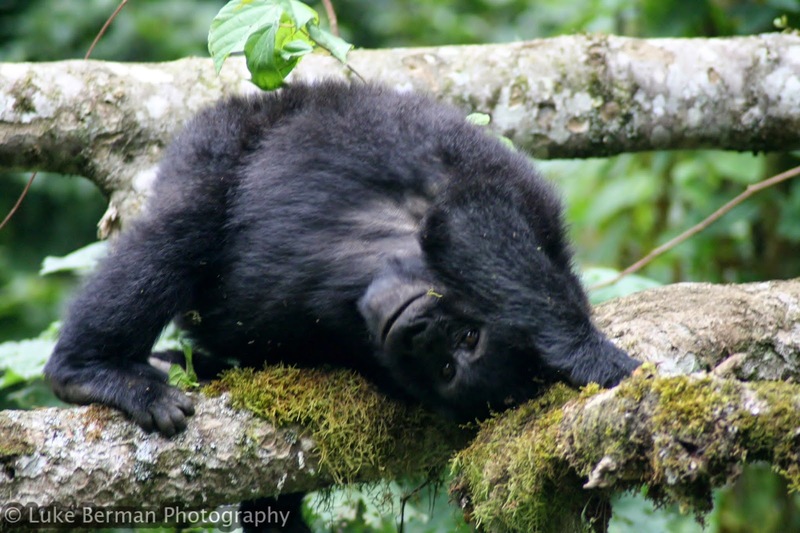 As we started heading back (all up hill) we went past the alpha silverback who was lying down on his stomach, resting with his eyes shut. This proves how effective and successful this habituation and ecotourism project is; they are very comfortable with us around. Off we went, back to reality after having the most amazing experience of my life. The rangers planned the trek so well we were back at the briefing station by 12pm with the whole afternoon to see what else Bwindi had to offer. I visited the local village and went on a nature walk with a staff member from the lodge. The scenery was so fascinating and it was deafly quiet, pleasant, with only the occasional farmer working, child playing or bird tweeting to break the silence. On returning to the lodge the local kids were getting ready to sing and dance for us in their matching yellow t-shirts bearing the words “GorillaChildren”. They ranged from 3-13 and gave us the most incredible experience that would have put most theatre productions in the West End of London to shame. Within their first song they welcomed us to Bwindi and thanked us for investing in their community (I learnt 20+% of the permit money goes to community development and pays for schools/hospitals and salaries of teachers). Nothing could top the hour I spent with the gorillas but this came close, near the end they even invited me up to dance with them (how could I refuse); they put me to shame with their moves though. After saying goodbye to them I was left to enjoy the evening camp fire reminiscing on the events of the day with my final night in the mountains. 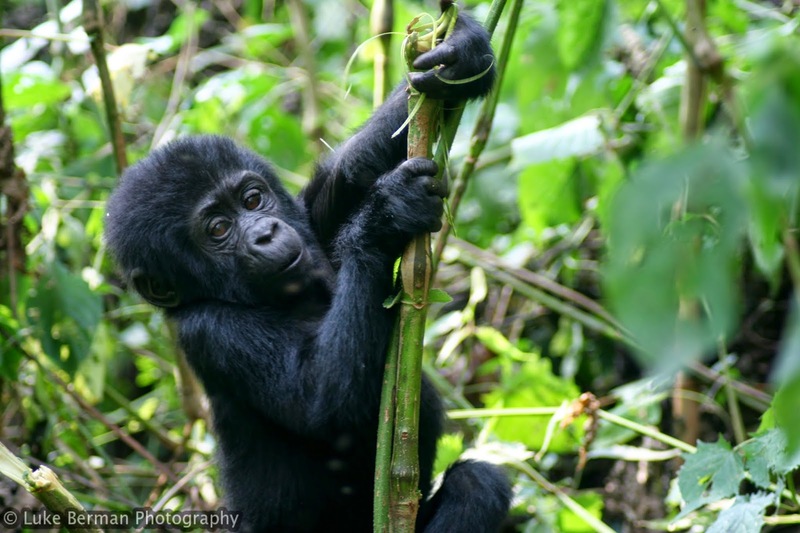 Uganda is a beautiful country with lovely people and amazing wildlife and is well worth a visit. They have many national parks that I would love to come back to and see for myself. 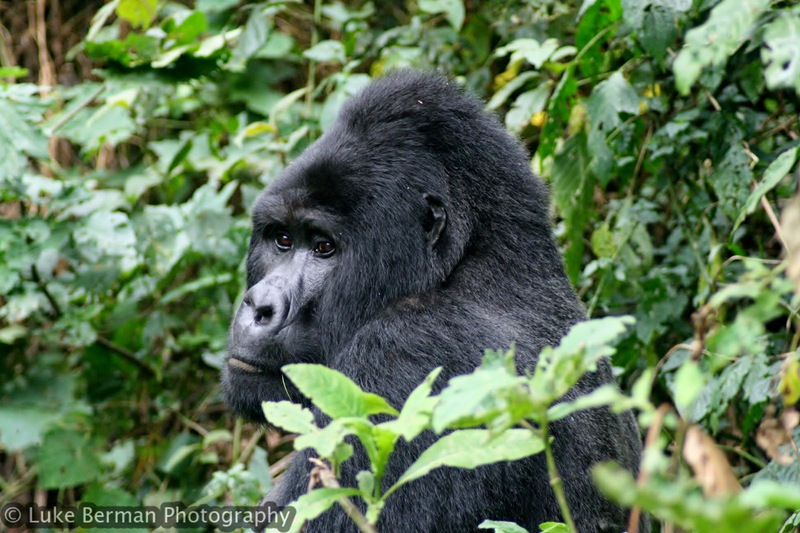 I would like to thank Agaba of A&A Gorilla Tours Ltd and especially our guide Paul for the fantastic job they did. Everything about the trip was well done and you could see they really love what they do and care about the work. The places we stayed in were lovely and have a particular link to the local communities; plus the staff were really friendly. Paul was so knowledgeable, suddenly stopping and pointing out a bird, or describing the landscape so it made more sense; or even telling us to sniff the air (we were passing through a region that was famous for growing onions and yes you could smell it in the air). I personally could not recommend them highly enough and if you are even contemplating the thought of seeing the gorillas use these guys; do mention my name if you do. My visit to Ukunda, a local Kenyan town.